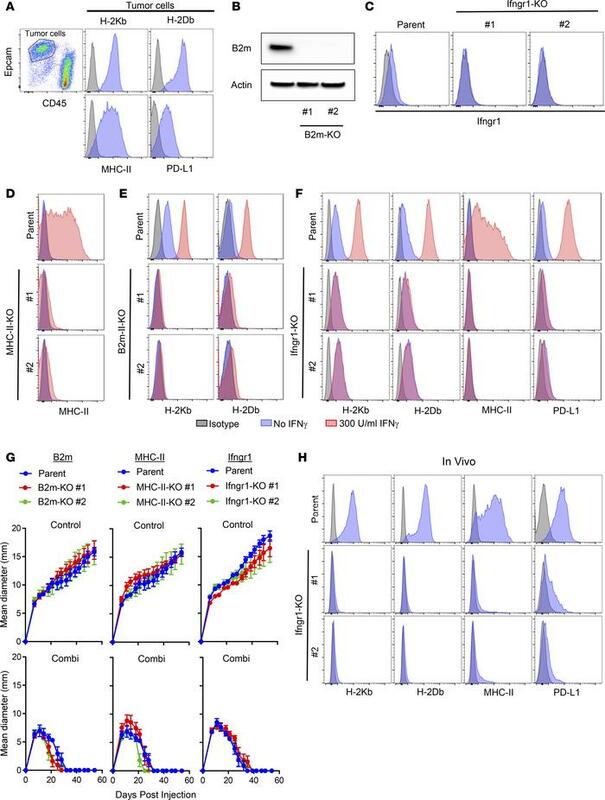 Immune checkpoint blockade–induced rejection of MCB6C tumors is not dependent on expression of MHC I/II or Infgr1 on tumor cells. (A) In vivo MHC class I, MHC class II, and PD-L1 expression on MCB6C tumor cells 14 days after injection. (B) B2m expression, as shown by Western blot, of MCB6C using B2m-KO clones grown in vitro. (C) Flow cytometric evaluation of Ifngr1 expression on MCB6C Ifngr1-KO clones in vitro. (D) Flow cytometric evaluation of MHC II on MCB6C MHC II–KO clones in vitro, with and without IFN-γ stimulation. (E) Flow cytometric evaluation of MHC I on MCB6C B2m-KO clones in vitro, with and without IFN-γ stimulation. (F) Flow cytometric evaluation of MHC I, MHC II, and PD-L1 on MCB6C Ifngr1-KO clones in vitro, with and without IFN-γ stimulation. (G) In vivo tumor growth of B2m-, MHC II–, or Ifngr1-KO MCB6C lines with and without combination ICB starting 9 days after tumor injection. Data are shown as mean ± SEM. n = 5 per organoid line per treatment. (H) Flow cytometric evaluation of MHC I, MHC II, and PD-L1 on MCB6C Ifngr1-KO clones from MCB6C tumor cells grown in vivo and harvested on day 11.